Answer: The LA Spa Filter Bag Replacement filters are made by a filter manufacturer who manufactures 65% of all filters that are made out there. The LA SPA FILTER BAG OEM FD-51500 filters are made by MAAX Spas who owns the brand LA Spa. The replacement filters are double glazed versus the OEM are triple glazed. What glazed means? Glaze is the element used for the filtration. The more glaze the stronger it filters the water. The replacement filters tend to run slightly larger than the OEM initially but do shrink a little. 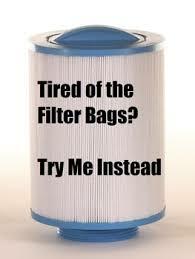 Filters should be cleaned every 3-4 weeks depending on the spa usage. Have 2 sets of filters. One clean set and one set in use. After cleaning the filters, (DO NOT LET THEM DRY WITHOUT RINSING) rinse each filter thoroughly with light pressure hot water. Hang to dry. LA Spas Filter Bag Basket 3"